If you closely examine the history of local Sears homes and their owners, sometimes you can also learn more about the history of Chicago, its suburbs, and life in the era before WWII. This week's kit house in Glen Ellyn will take us on a couple different tangents--an exciting path to travel if you're a history buff like me. 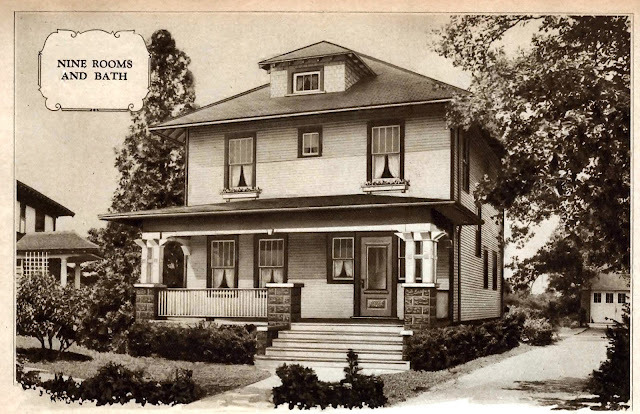 Photo of the same house from a Sears advertising poster in the 1920's. Scan courtesy of Andrew Mutch. The house at 450 Turner is an authenticated Sears Woodland model. The Woodland was a spacious nine-room house. It had a deep front porch (now enclosed) flanked by triple wooden posts. Sears Woodland from the Modern Homes catalog. The letter featured with the photograph on the poster was sent by William Wallace Shaw, Jr., the original owner of the Woodland. He got a mortgage for $5,900 from Sears, Roebuck in May 1922. He had a contractor build the house for his family. He and his wife, Violet, lived in the house until at least 1950. Shaw was an illustrator for the Chicago Tribune during the 1920's. He specialized in cartoon maps. 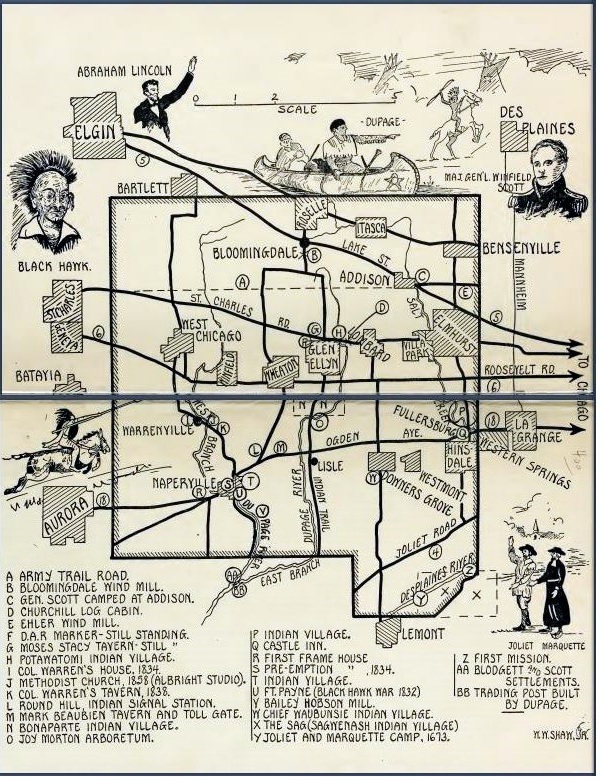 Below is a map of the Western suburbs drawn by Shaw for the book The Story of an Old Town--Glen Ellyn (1928). Shaw's illustration with Glen Ellyn in the center. The map is signed in the bottom right corner. Shaw has another place in history other than for his enduring artwork. In 1927 AT&T began offering telephone service across the Atlantic Ocean from the U.S. to London. Each call was transmitted via radio. Only one call could be placed at a time from the U.S. and the cost was $75 for three minutes (over $1000 in today's dollars). According to the blog Our Town, Shaw initiated the first telephone call from Chicago to London in February 1927. The first year that transatlantic telephone service was available, there were 2250 calls placed to the U.K. In 1956, service to Europe moved to the first transatlantic submarine telephone cable. Sears used Shaw's comments about his house in many different ads. Here is a snippet from another Sears poster that listed testimonials from Chicago area customers. Because I can't stay focused on anything, what drew my attention was the icon on the left side. A goddess with a bird on her head and "I Will" written on her breastplate. This was supposed to represent the city, apparently, but I had no idea who she was. In 1891, the Chicago Inter-Ocean newspaper started a contest. They had devised a new city slogan: "I Will" and asked people to create artwork that personified this spirit. The winner was Chicago artist Charles Holloway, the same artist who created the mural on the proscenium arch in the Auditorium Theater. Holloway's winning illustration. A goddess with a crown that has a phoenix rising from the flames. "I Will" is written on her breastplate. This image was used for many decades after the contest to represent Chicago. It was reinterpreted by other artists, including Lorado Taft. The World's Fair of 1933 used her image on posters. Even today there is a statue called "I Will" by sculptor Ellsworth Kelly standing on Fullerton Avenue that is dedicated to the indomitable spirit of the city. This is wonderful. I love it when we connect Sears Houses to local history. It makes all the time we spend worthwhile. Great work!